The Fairchild C-119 history goes back to army requirement for a freight carrier with a large cargo hold with ground level loading capability. Fairchild's answer to that requirement was their model 78. 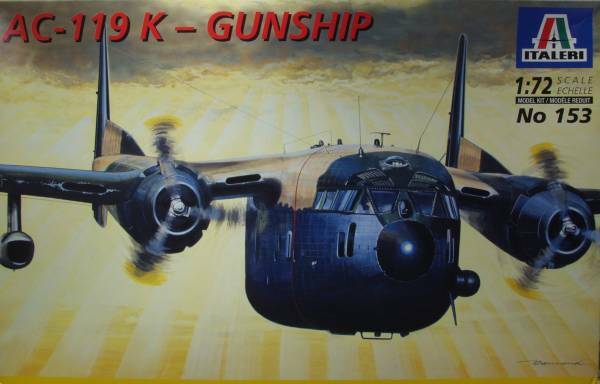 Initially it was requested that this aircraft be of wood construction and after a year was spent on the design and drawings the army ordered Fairchild to redo the drawings for an all metal aircraft. The army designation was the C-82 in service and was given the name "Packet". The XC-82 first flew in September of 1944. The XC-82 was deployed to Saipan in 1944 as part of the test program. An initial order for 100 C-82A's with deliveries to begin in 1945. A second contract for 100 more issued and a second manufacturer was to produce the C-82. A new production line was established at the North American plant in Dallas and a contract for 782 C-82N's was issued. Only three of these had been completed when the contract was terminated on VJ day. The C-82 entered service in May of 1945 and the production run of 223 aircraft was completed in September of 1948. The twin-boomed, high wing, podded fuselage aircraft had a fuselage capable of handling a variety of standard military vehicles. The aircraft was powered by a pair of Pratt and Whitney R2800 engines driving Hamilton standard three-bladed propellers. The crew consisted of a pilot, copilot, navigator, radio operator and crew chief. It was capable of carrying up to 42 paratroopers or 34 litter patients. In 1947 an XC-82A was modified to lower the flight deck and move it forward, delete the ventral fins and install more powerful R-4360 engines of 2,650 hp. Addition windows were added to the nose to enhance drop zone visibility. thus modified the air frame was re designated the C-119A and made its first flight in December of 1947. The Air Force ordered 55 of them in 1948-49, designated C-119B models. The booms were weak in the B model, so they added dorsal fins, reworked the horizontal and vertical stabilizers. The next model was the C model of which the most C-119s were built in 1950 through 1952. These had P&W 4360s, with Hamilton Standard props, most reversible, some not. Many of the last ones built as C models, were modified in the field as F models. This consisted of dual nose wheel tire to replace the old single one that shimmied very badly, ventral fins under the tail, and some other minor internal modifications. About this time, General Le May decreed that all SAC reciprocating engines should be the same, and he chose the R-4360, which was then on most of the SAC aircraft. So the rest of the F models then on the assembly line and the G models that were built in 1953 - The 53-32xx and 53-78xx numbered aircraft all were fitted with Wright 3350s and Aeroproducts 4-bladed props. All remaining C-119s were eventually modified to be G models. The Aeroproducts props had a deadly fault. They were prone to over speed. When the need arose in Vietnam for a 3rd gun ship, 56 C-119s were pulled out of mothballs in Tucson in 1968 and converted to AC-119G and AC-119K models, they still had 3350s, and Aeroproducts 4-bladed props, and went to Vietnam and were flown with those props until there were several runaway over speeds, that caused the loss of one Shadow and one Stinger. The Shadows had to keep the Aeroproducts propellers because they did not have the extra help of the two jet engines carried by the Stingers, however the Air Force converted the AC-K Stingers to Hamilton Standard 3-bladed props that gave less thrust, but were not prone to over speed and runaway with the engine. My interest in the AC-119 comes from my service with the 317 Field Maintenance Squadron at Lockbourne Air Force Base near Columbus, Ohio from late 1968 through early 1970. During this time crew training was being performed on the base for the crews that would be taking these aircraft into battle. While I never had the chance to get any hands on work on these aircraft I could hear them many nights as they droned around over the base practicing their pylon turns and learning how to use the equipment that located targets. The Italeri AC-119K comes in a fairly large sized two part top open box with an in your face artwork of the subject model. Inside the box there are five sprues molded in black and not bagged and one bag with the clear parts. A fair number of parts were off the sprues. The kit came from an eBay dealer and was shrink wrapped but it may have been opened and resealed at some point so I don't know for certain it came from the manufacturer that way. Fortunately it appears that all parts were present and no parts suffered anything worse than some minor scuffing. The kit has been around a while and has raised panel lines. These are actually quite well done, very fine and uniform but may prove problematic trying to restore ones that are lost during assembly. The parts are crisply molded and have a minimal amount of flash on them. I did not find any sink marks or other surface blemishes on any of the airframe parts. There are a fair number of ejector pin marks that will be troublesome if you find them unacceptable. They are present on the gear doors along with otherwise nice structure detail and roof of the gear bays, which also features structural detail. They also mar numerous parts of the interior detail as well and are on the landing gear struts and one side of the tires. The control surfaces are all fixed. 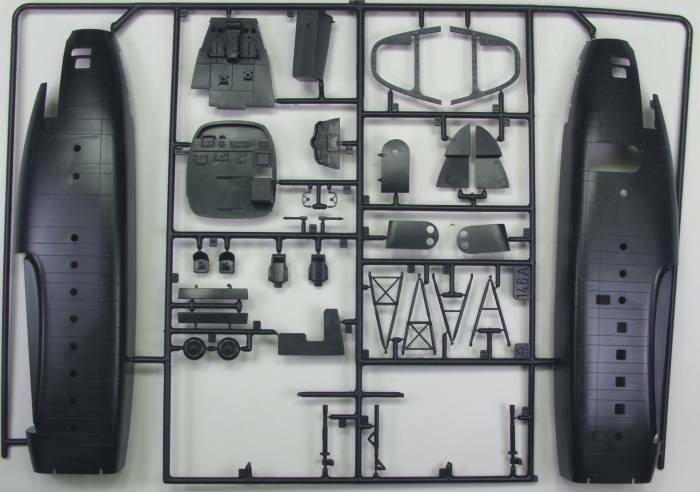 The kit includes a rather extensive level of detail for a 1/72 scale model. 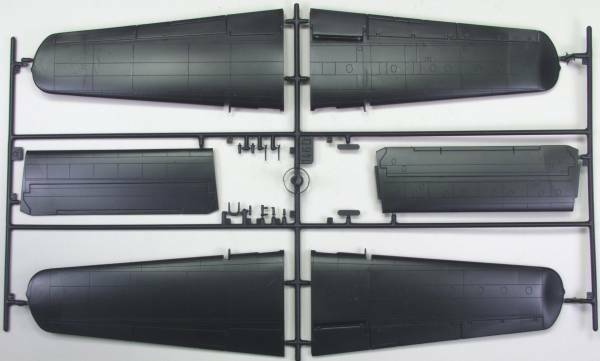 The insides of the fuselage features structural detail in the cargo area and molded on panel detail in the flight deck area, albeit marred by several prominent ejector pin marks. The flight deck includes the instrument panel with raised instruments, center console, control columns, seats for the pilots, navigator and radio operator. These do not have belts or harnesses. The bulkhead dividing the flight deck from the cargo area is detailed appropriately on both sides with the cargo side showing ejector pin marks. The cargo area has both a floor and ceiling. The floor has all of the weaponry for it. The rear clam shell doors are very nicely detailed and even the small crew doors have interior detail and ejector pin marks. The wheels wells are boxed in and feature structure detail. The engines have minimal detail but do include both rows of cylinders but the cowlings are very tight fitting and the engines can't be seen all that well any way. The two jet pods feature only intake and exhaust detail. 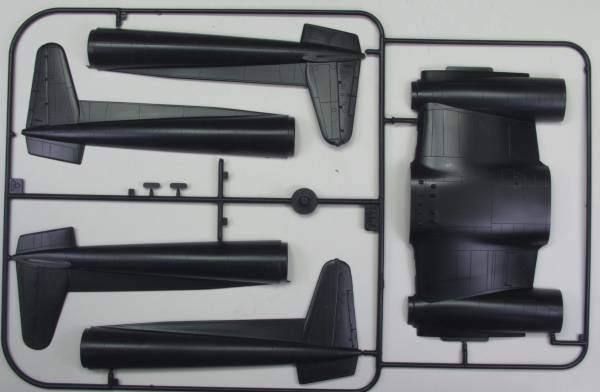 The kit also includes most of the important of prominent details that were added externally when modifying it from a cargo carrier to a gunship. One accuracy bugger with the kit deals with the props. Although the K models were originally equipped with four bladed props, these were changed prior to seeing much service in Viet Nam and the kit would more correctly represent an in service aircraft with three bladed props and this in indicated in the artwork on the box but the kit supplies only the four bladed props. 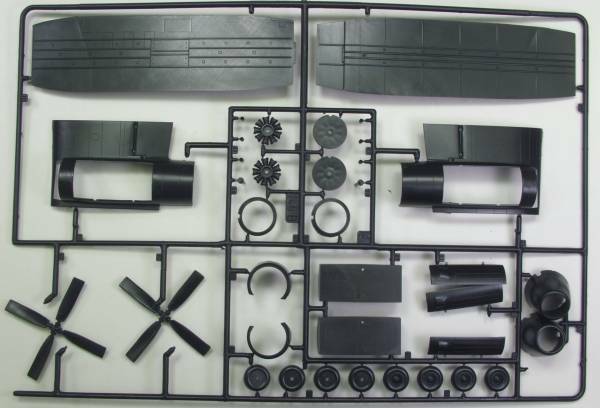 Altogether the kit includes 135 parts by my count molded in black. See photos below. The clear parts are a bit thick but nice and clear and should look great when coated with Future. The smaller cargo area windows have a bit of a bulls eye effect in them but they are small enough that it shouldn't be all that noticeable. altogether there are 37 clear parts for a kit total of 172 parts. See photo below. The decal sheet is rather small as the marking on these aircraft were minimal. There are decals for two different aircraft with their attendant artwork. No stencil detail is included. The decals are thin and in register. See photo below. The instructions are printed on a long folded sheet that consists of ten panels. The first panel hs a brief history in multiple languages, the second panel has basic kit instructions in multiple languages and multilingual forms for ordering replacement parts, the third panel has a parts map, the forth panel has a color list calling out Model Master paint numbers and starts the assembly diagrams, panels five through seven are the balance of the assembly instructions, panels eight and nine are painting and marking diagrams and the tenth panel has multilingual safety warnings. At one time Cutting Edge had a mask set for the kit but with their demise finding it would mostly likely require luck on eBay. The good news is that AOA Decals recently released a set for this kit that is just what the doctor ordered. 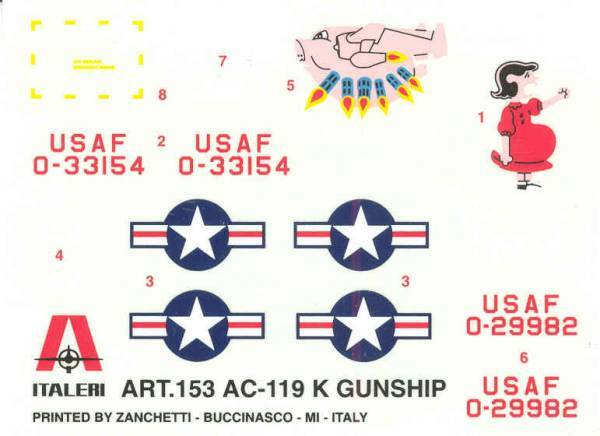 Printed by Cartograph, one of the best decal printers in the world The set includes markings for a whopping 14 aircraft, 8 of them G model Shadows and 6 of them K model Stingers. 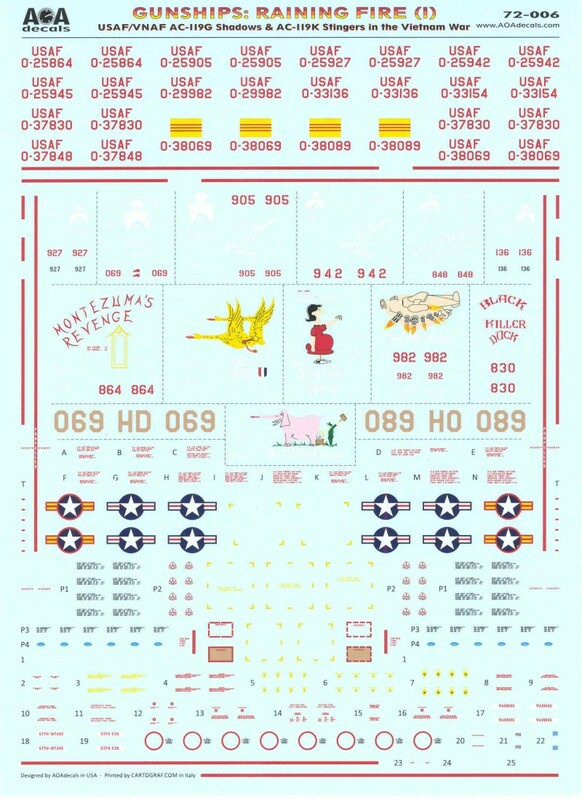 The instructions are printed in color on six 5 1/2" by 8 1/2" sheets, glossy in finish. One side of one sheet has a list of some of the more obvious changes that need to be made to the kit to make it more accurate. One sheet has the stencil placement printed on both sides. The sheets include painting instructions. Two of the aircraft have VNAF markings as some of the aircraft were turned over to them. The decals have a glossy finish are in perfect register and almost all of the stencil information is readable under magnification. An excellent set and very much needed as the kit decals are pretty poor. This is actually a fairly nice kit in spite of is age. I suspect the fit is not quite up to current standards but nothing that can't be dealt with but one will need to exercise care when filling and sanding not damage any more of the raised detail than necessary. My biggest gripe if you haven't already figured it out is the large number of ejector pin marks that need to be dealt with. Other than that I don't see any major stumbling blocks that would prevent most modelers with some experience from doing justice to the kit. Here is a nice build of the standard C-119 which is basically the same model and another in box review can be found here. Two internet resources, the first on the C-119 in general located here and one dealing with the AC-119 located here.